Everyone's favorite Christmas marshmallow peeps with a twist. Peeps chocolate mousse reindeer's are a favorite choice amongst chocolate lovers. 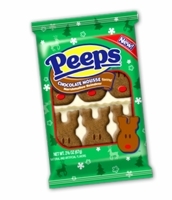 You get the soft marshmallow peep in the shape of a reindeer head with a yummy chocolate mousse flavor. You get chocolate and marshmallow all in one bite. Each box of Chocolate Mousse Reindeer's has 6 peeps.